Whether English Language Learners live in urban centers or rural areas, field trips are exciting opportunities to get out of the classroom, explore the community, and help students practice their English skills. Some English Language Learners who move to the United States live in communities with other immigrants who speak their home language, and maybe they don’t explore areas outside of their familiar, local community. Field trips can open students to new experiences in a new culture. However, it can be stressful to organize a group of students who don’t speak English very well or who have limited knowledge of the language. You want to ensure students get something out of the field trip and the information presented doesn’t go over their heads. There are some simple things you can do to prepare your students. Preteach vocabulary that students will need to know to access the information presented during the field trip. Have students practice the new vocabulary and give each word context within the field trip setting. Make sure the permission slip contains all of the details parents and guardians need to know. And of course, make permissions slips available in the home languages of your students. You may enlist the help of a bilingual coworker to call home if permission slips don’t make their way back to you. Encourage bilingual chaperones to volunteer for the field trip. Having an adult available to translate information presented during the field trip can mean the difference between a student who is engaged in the field trip and one that is just along for the ride. Anxious students will also feel more at ease having a parent or guardian around who can communicate easily with them. Before the field trip, inform the guide that students for whom English is not their first language will be on the trip. Ask guides to speak more slowly with simply sentences, use gestures, props, and other visuals when possible, and clarify information for students as necessary. 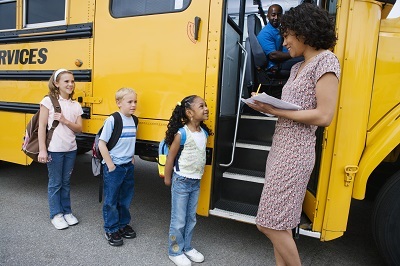 Then after the trip, allow time for students to write about the field trip. Consider pairing or grouping English Language Learners with more advanced English speakers to express what students liked, learned, and would like to know more about regarding the field trip. It is important that students reflect on their experiences to make connections between their outing and classroom content, and this presents another opportunity for students to practice their English skills.